Feel free to halve or double this recipe for homemade bacon — adapted from Karen Solomon's Jam It, Pickle It, Cure It — if more or less pork belly comes into your life. Trim the belly into a nice rectangle. In a bowl, stir together the sugar and molasses. Stir in the kosher salt, pink salt, and pepper, then rub it all over the meat. Place the meat in a 2-gallon zip-lock bag, place the bag on a rimmed sheet pan, and refrigerate for seven days, flipping the bag daily. 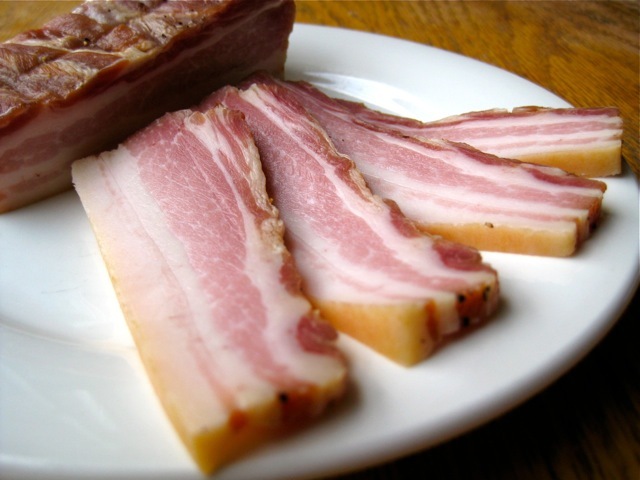 Check the bacon for soft, uncured spots. If you have any, they'll be found in the thickest part of the belly or right in the center. They will feel like mushy, uncooked chicken. If you find any, add an additional 2 tablespoons salt, rub through the bag to distribute, and check again in 1 to 2 days. After the meat is fully cured, discard the curing solids, rinse the meat, and pat dry with paper towels. Preheat the oven to 200 degrees. Place the meat on a rack over a sheet pan or roasting pan and roast for 2 hours, to an internal temperature of 150 degrees. (Start checking it at 90 minutes.) If the temperature hasn't reached 150 degrees after 2 hours, raise the oven temperature to 250 degrees and check the meat every 10 minutes. Remove the bacon from the oven and, using a sharp knife, remove the skin. This is easier than it sounds, as long as you work while the fat is still warm. Brush the bacon all over with liquid smoke. Cool to room temperature, then refrigerate up to 10 days or freeze up to 3 months.